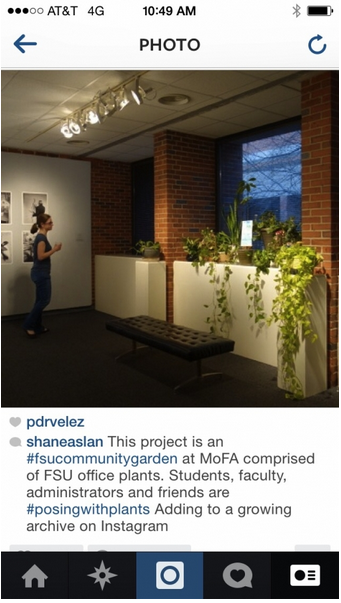 Shane Aslan Selzer, participating artist in spring ’14 exhibition Making Now: Open for Exchange at FSU’s Museum of Fine Arts, shared this video that documents her project What We Care For (an FSU community garden) through the instagram hashtags used by individuals to archive their portraits. The video is currently being shown in a group exhibition titled, Prove It To Me curated by Natasha Marie Llorens at Reverse Gallery in Brooklyn. 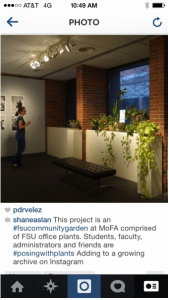 On the website, there is also a conversation about the project between Shame and the curator, which was conducted via Instagram and recorded using screen grabs.